In the forex market, we often discuss the concept of correlated pairs. This is because, inevitably, a currency must be paired with another currency to determine its relative value at any given point. In the futures market, this value is derived from the dollar because it is the reserve currency of the world and has been since 1944. We can use the pair’s phenomenon to forecast, with some reliability, the market direction on any given day. The relationship in play is market correlation. Our approach here helps answer the age-old question of whether a particular day is a good trading day — or not. Too often, we note at some point during a trading session, “This is a great trading day,” or “Why did I even bother?” Here we’ll attempt to show how these relationships play out together and which ones are exploited more easily for profit. In a good trading day, related markets are expected to rise based on the relevant fundamentals. Traders seeking to take advantage of this relationship will place long positions in the appropriate markets. On the other hand, during bad trading days some markets are ripe for short positions, or they should be avoided altogether as these relationships tend to be less predictable. What makes a “good” trading day good? First, the trends typically tend to be less volatile and more reliable. When positively correlated markets are rising, they often do so in a more controlled fashion. What are here termed “bad” trading days also can be profitable if accommodating positions are put in place; however, the profits are less reliable and the risks are greater. Simply put, profits are easier to come by for traders, particularly those with less experience, who focus on exploiting bullish tendencies rather than price breaks lower. A trader can view the futures market prior to market open (pre-market) and get a sense, using key fundamental relationships, to detect the underpinnings of a good trading day. Once a day is identified as a possible good (or bad) trading day, you know how to approach it. Either you will press your advantage as trends develop, or you will sit on the sidelines and wait for a safer opportunity. Keep in mind that trading days can change. Just because a day sets up well doesn’t mean it will stay that way. Many things can happen during the course of a trading day; for example, a geopolitical event can occur without warning. Seeing this and changing course if need be, though, is all part of being a trader. Your immediate goal is recognizing key fundamental relationships that can set the tone. Four strongly related markets for determining that tone are financials, crude oil, stock indexes and metals. By financials we mean the U.S. dollar and the Treasury bond markets. By stock indexes, we are referring in large part to the S&P 500 and Dow Jones Industrial Average. By metals, we are referring to gold. 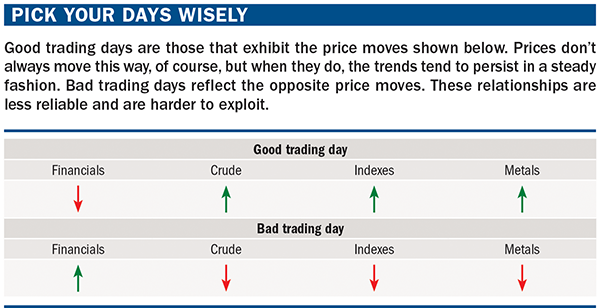 The directional relationships between these markets, and which movements compose each day type, are shown in “Pick your days wisely” (below).